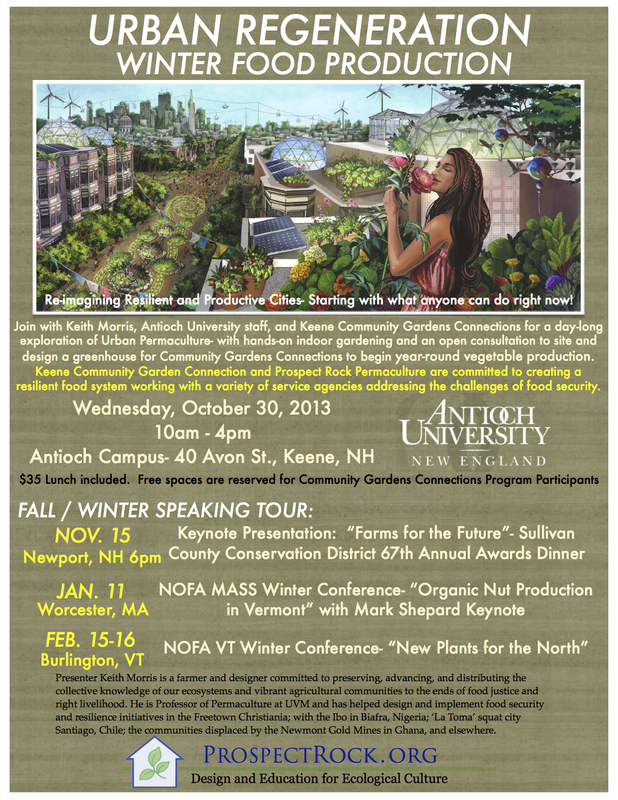 Join with Keith Morris, Antioch University Staff, and Keene Community Gardens Connections for a day-long exploration of urban permaculture, food security, ecological regeneration, and year-round food production. We’ll introduce the concept of permaculture with a focus on its application in urban context, for renters, and food security / resilience support. $35 fee includes lunch, free spaces for Community Gardens Connections program Participants. Space is limited! Register now by contacting Monica Pless at mpless@antioch.edu. Keith Morris is a farmer and designer based in northern Vermont who is committed to preserving, advancing, and distributing the collective knowledge of our ecosystems and vibrant agricultural communities to the ends of food justice and right livelihood. He teaches ecological farm design at the University of Vermont, the Yestermorrow Design Build School, Sterling College, Paul Smiths College, and with other community organizations. For the past 17 years he has been working with farmers, community organizations, and conservation groups to implement ecological regeneration, food production, and integrated farm infrastructure throughout the northeast. He regularly works regularly in New York City, and has helped design and implement food security and resilience initiatives in the Freetown Christiania; with the Ibo in Biafra , Nigeria; ‘La Toma’ squat city Santiago, Chile; with the communities displaced by the Newmont Gold Mines in Ghana ; and elsewhere. Stay tuned for more details regarding the upcoming keynote presentation for the Sullivan County Conservation District’s 67th Annual Awards Dinner- focused on farm-scale permaculture, farm legacy, and connecting older farmers with younger/ newer growers and homesteaders. We’ll also be presenting at this winter’s NOFA MASS conference Jan. 11 with Mark Shepard, and February 15-16 at the Winter NOFA VT Conference. Please feel free to share this email/ page with any potentially interested friends, networks, listervs, or groups. Thanks for the heads up! And glad you like the resilient cities image.